Channels: Record up to 4 channels (max). Expandability: Cannot be expanded or clustered. Compatibility: Compatible with all TV sources. Includes SnapStream core features: TV recording and search, unlimited TV clips, Twitter and Facebook integration, file export and more. Channels: Record up to 15 channels (max). Expandability: Cluster multiple appliances together for unlimited recording and storage. Network: 1Gb, 10Gb copper, 10Gb fiber Ethernet. Connect SnapStream to your organization's wired or wireless LAN for easy access to television. Now everyone in your organization can watch TV on every Mac and PC. And don't forget you can expand your SnapStream as your needs grow. The newly designed SnapStream ShowSqueeze Node supplements the SnapStream appliance with additional processing power for workflows involving high volumes of transcoding and other tasks. It quickly transcodes recorded TV from MPEG-2 to H.264 or WMV, and can run up to 10 SD or 8 HD real-time transcodes simultaneously. 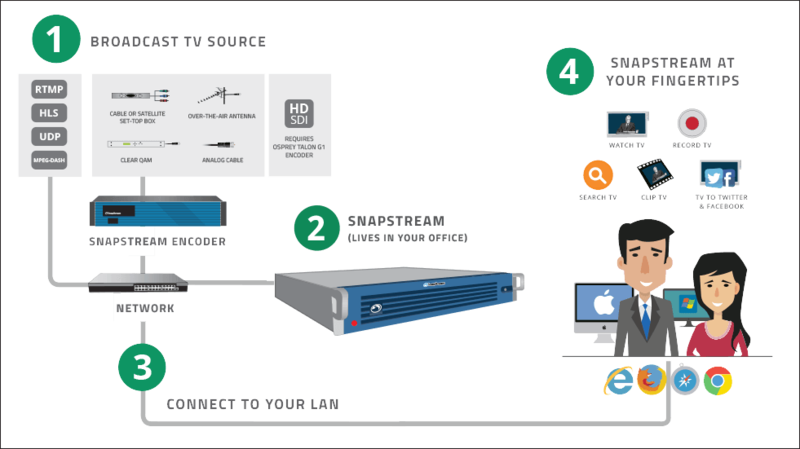 The SnapStream HD-SDI Playout Node converts recorded TV files to SDI, the industry-preferred option for broadcast-grade video. It can play out full-length recordings or TV clips from SnapStream directly into editing suites like Avid and Final Cut Pro. The SnapStream Proxy Generation Node generates low bitrate, low-res proxy files for up to 20 simultaneous recordings. Watch your recordings using much less bandwidth, while clips and exports occur on the original high bitrate, high-res recordings. The SnapStream Storage Node supplements SnapStream with additional storage, from 4TB to 40TB, as a robust platform for building an extensive TV archive. It clusters seamlessly, so all recorded TV content remains actively searchable and usable within SnapStream's ecosystem. Expand your SnapStream library onto your own NAS or SAN for a per-TB license cost.